As much as baking, Slovak women (and girls) love playing with cream and inventing new desserts from what they can find at home. 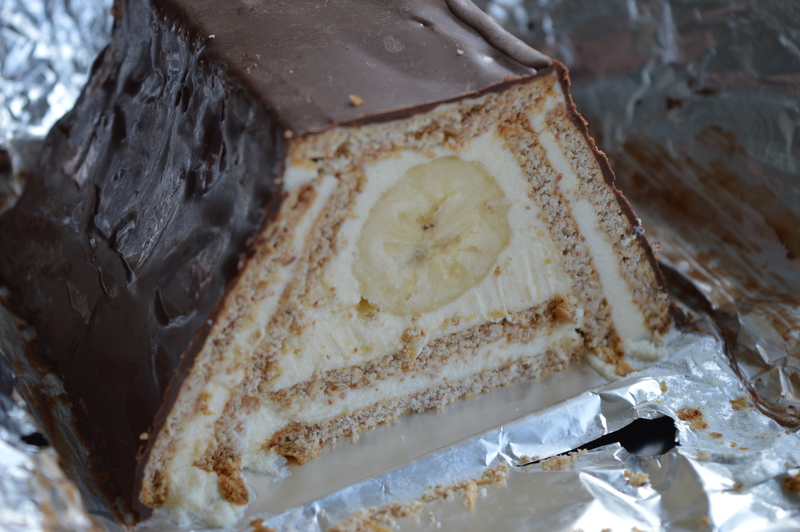 This was probably the case with Banana ‘Triangle’, ‘Roof’ or ‘Pyramid’, to give but a few names this cake can be found under on Slovak cooking websites. But I didn’t know that when I decided to make it for Easter. I didn’t have time to do more research in the midst of shopping and cleaning. I knew, however, I wanted to make something special for my family. Well, my Mum was coming to stay, and that meant an extra pair of hands. Golden hands. Mum has a passion for baking, as well as plenty of expertise in the field. To cut the long story short, I came across the recipe when I was leafing through my old, hand-written recipe book. The recipe was for a ‘Banana Triangle’ and it had come from one of my friends. I remembered trying it once before, but couldn’t recall any details. With no pictures but a few instructions, all was up to our imagination. As you can see from the photo, we ended up with a slightly different shape. *If you can’t get hold of ‘pudding’ powder in your country, look for custard or any other powder for preparing pastry cream. In Slovakia, a packet of ‘pudding’ powder is meant to be cooked in ½ l milk. 1. Prepare 1/2 l of the vanilla or banana ‘pudding’ following the instructions on the packet. 2. Cream the butter and the castor sugar until smooth. 3. Gently fold the ‘pudding’ in the butter. 4. Lay the biscuits in 3 rows on a sheet of tinfoil. The recipe calls for 7 biscuits in each row, but that will depend on the biscuit size. As you may have noticed, I miscounted my rows but only realized that when reviewing images. It had no effect on the final product though. 5. Spread almost half the cream on the biscuit base. 6. Put another layer of the biscuits on the cream. The biscuits tend to slide on the tinfoil sheet when you’re spreading the cream over them, so it’s good to have that extra pair of hands at this stage to help you hold the rows together. 7. Spread the other half of the cream on top of the second layer of the biscuits. Make sure to leave some cream to put on top of the cake. 8. Place the peeled bananas along the middle row of the biscuits. 9. Lift the outer rows of the creamed biscuits and press them gently towards the bananas to encase them. To ensure the bananas follow the middle row of the biscuits, you’ll have to play with their length and shape as seen in photo 8. 10. Fill in the gaps in the cake structure with some more cream and cover with another layer of the biscuits if preferred. 11. Spread a thin film of the remaining cream all over the cake to better hold the chocolate icing at the next stage. 12. Wrap the cake in the tinfoil and put in the fridge for an hour. About ten minutes before taking it out, set about preparing the icing. 13. Put the margarine/shortening in a small saucepan and melt on a cooker over a low heat. 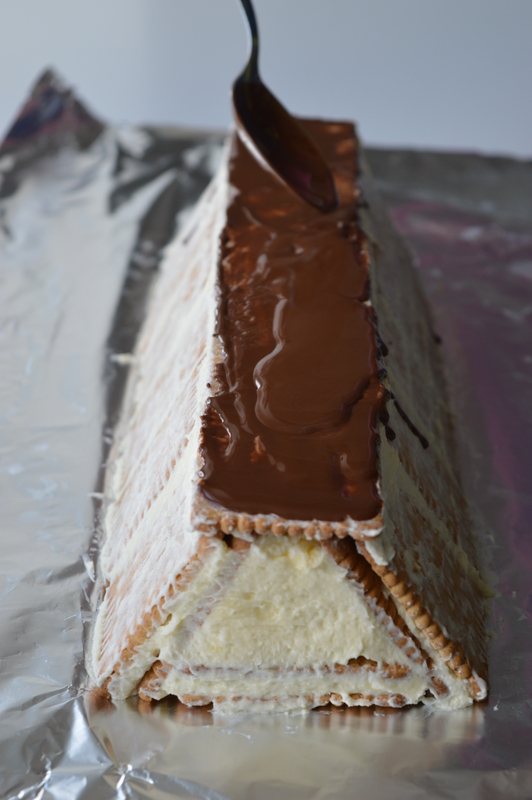 Break the chocolate bar into small pieces and add to the melted margarine. Stir until well-combined, smooth and shiny. 14. Pour the hot chocolate icing all over the cake. 14. 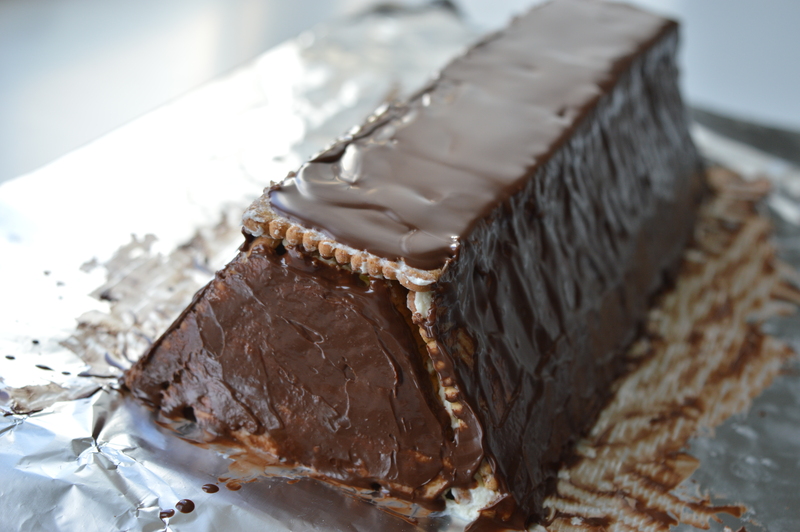 Take the cake out of the fridge and pour a thin layer of the hot chocolate icing all over it starting from the top. At this point my Mum’s skill came to full use. She is an expert in chocolate icing, and she will go to great lengths to make it perfect. I assisted her by returning the soft chocolate back onto the walls as it ran down, using a confectioner’s knife. We had to work fast, because the chocolate thickened as it cooled down. Of course, I was unable to take a picture of this last step, but hopefully you’ll manage to figure out how to do it. 15. When the chocolate icing has set and hardened, wrap the cake back in the tinfoil and put in the fridge or in a cold place. Serve cold and sliced. Tip 1: I only sliced as many pieces as needed per serving, and kept the rest of the cake wrapped up in the fridge. This way, the cake not only stays fresh longer, but the biscuits soften nicely while soaking up the cream and its flavours. Tip 2: You’re more than likely to have some chocolate icing left, as it happened to me. I used it to glaze another cake I was making for Easter. However, when stored in an air-tight container, the icing will survive in the fridge for weeks.